Easter is so close now. It just kind of snuck up on me! 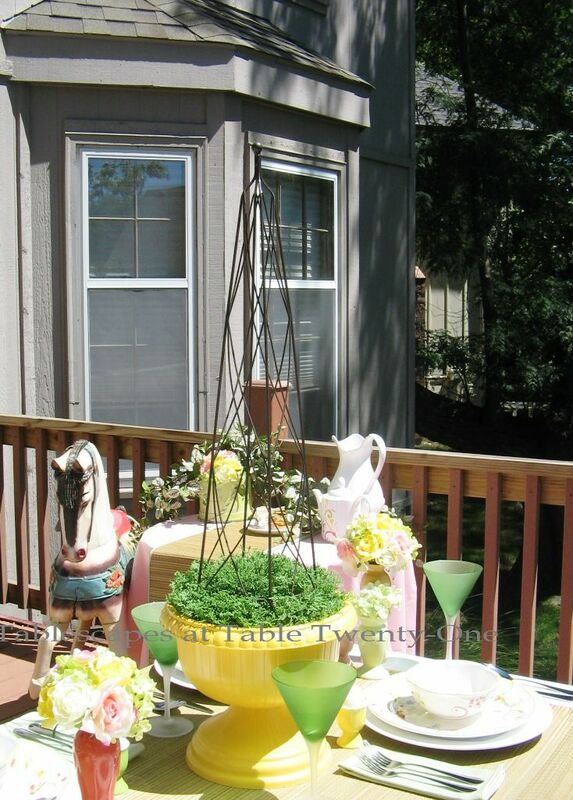 This light & airy table, set up on our deck, would be perfect for an outdoor Easter breakfast or brunch. 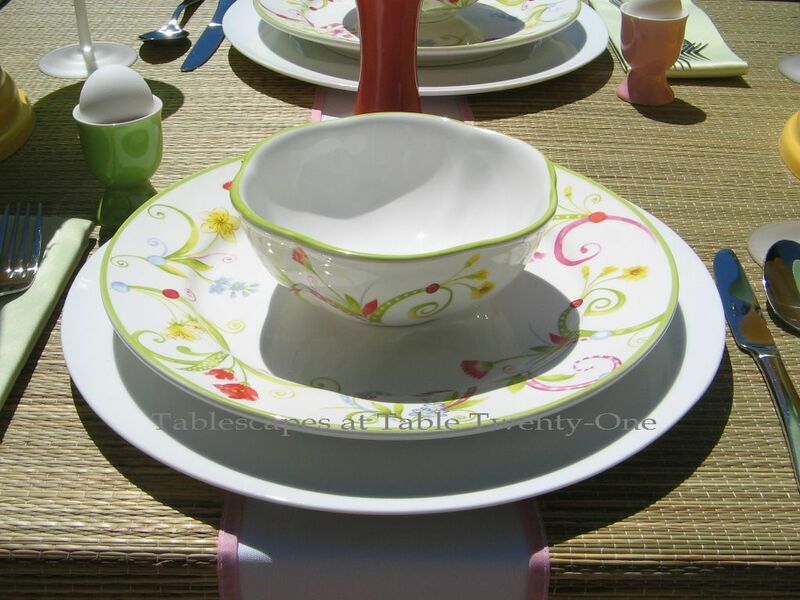 The happy melange of colors would work well for just about any casual Spring or Summer tablescape! It’s especially perfect to celebrate Liz’s (A Dish Here, A Glass There) March 24th birthday!!! A full-length white table linen is covered with two straw mat runners that extend across rather than a single one trailing the length of the dining table. The straw adds a textural element to the table while the pink cotton edging lends a tease of color. I found these “Lyda” dolomite dishes with the wonderfully whimsical pattern at Pier 1 a couple of years ago. (I like to refer to them as my Alice in Wonderland dishes!) It truly was a battle of wills as I waited until they hit the clearance section at 75% off. I was so glad to be able to get enough for 8 place settings. When dishes have a range of colors like these, that’s my cue to mix and match accessories with abandon! (Note that the egg cups, vases, straw mats, and even the flowers pick up on the different colors.) The white ceramic chargers are from Old Time Pottery. Pfaltzgraff “Legacy” stainless flatware is simple in shape and style so as to not compete with the wildly meandering pattern on the dishes. 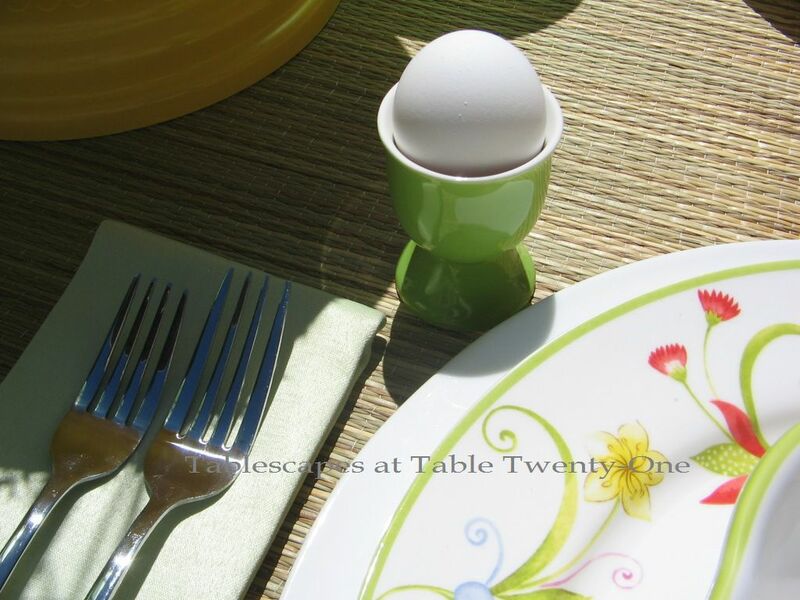 These colorful egg cups came in a range of colors at Crate & Barrel. I bought them in citrus green, as pictured here, as well as bubble gum pink, luscious lavender and lemon yellow. A colorful assortment of roses and hydrangea are assembled in various sizes of ceramic vases borrowed from our guest bedroom decor. The beverage table is dressed in a poufy pink full-length cotton linen. The straw mat runner is trimmed in a seasonal green. Next to the table is my beloved wooden carousel horse, most often used around here for Kentucky Derby table settings. (Click HERE and scroll down to “Run For the Roses” to see the horse used for Derby Day. 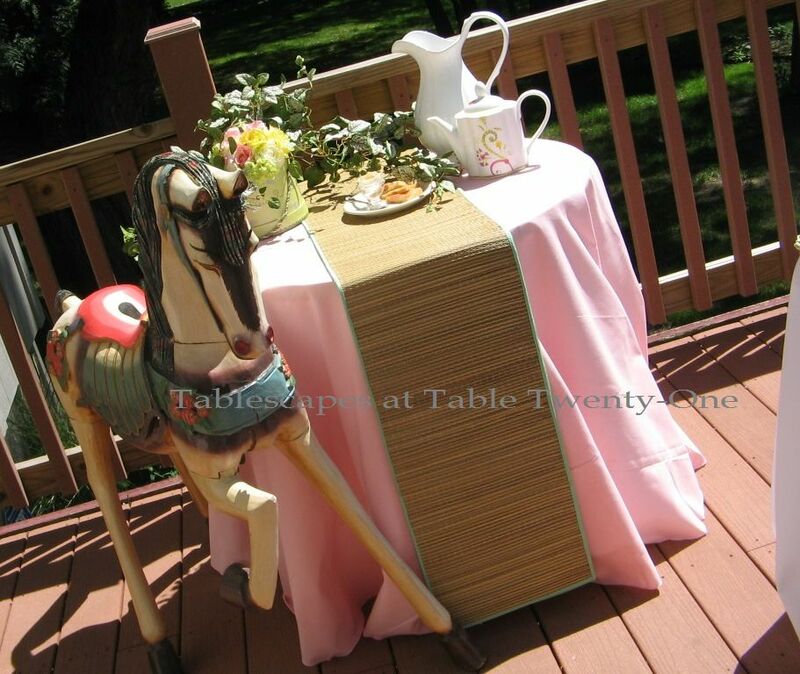 You can also click HERE to see him used on a Kentucky Derby buffet table!) The carousel colors on the dishes naturally made me think of him! 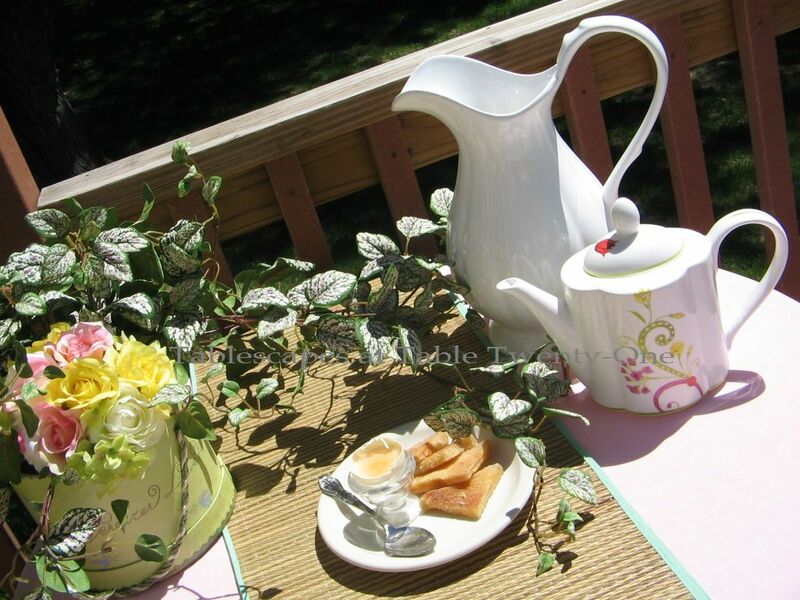 Pier 1’s “Lyda” teapot is great for serving any warm beverage. In hindsight, I should have bought more than one! A repeat of the dining table florals is found playing peek-a-boo from a fanciful hatbox. Greenery vines lend more presence to the table. I hope you’re just about ready for Easter! I still have eggs to dye and a coconut cake recipe to refine. From our house to yours, may you be blessed with a peaceful Easter weekend! Please join me again this week for Tablescape Thursday! I guarantee my blogger buddies will have lots of great tablescapes to share with you! Alycia…there is that gorgeous view again…I have not even begun to think about my Easter table…yours is, as always, gorgeous…love those “K-Mart special” urns…the colors on the table are perfect and I love, love the runners..what a great way to add more texture…You are the master!!! What a beautiful table, all fresh and Springy! The yellow urns/arrangements are a stroke of genius. But may I just say that the horsie is my kind of pet! Cute, colorful, and he just stands there looking decorative and doesn’t poop everywhere! I have always wanted a carousel horse — but it’s either that or drive a car, which does seem a bit more practical. I’ll just admire yours. Lucky girl. Makes me want to put on my Easter bonnet ! I like the way you used the straw mats. You are so clever ! Alycia, this table is most fabulous.. So glad you got to play outside! 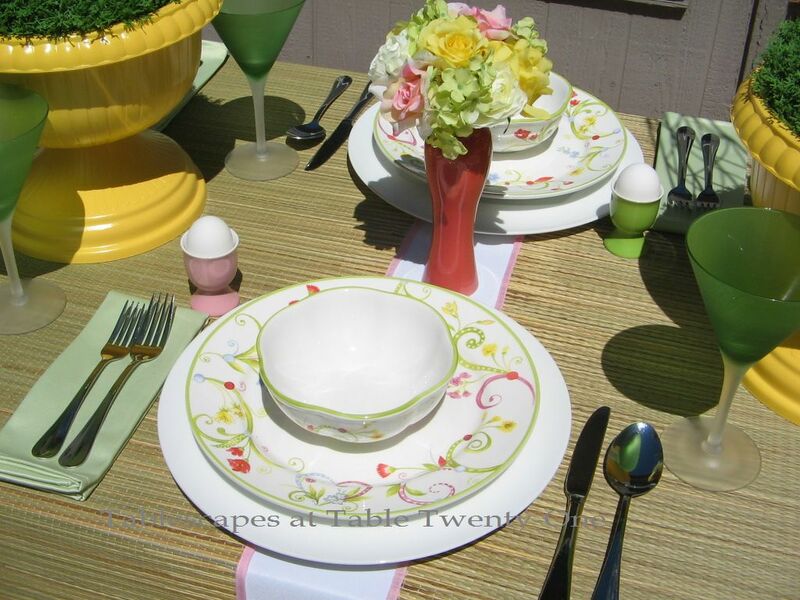 I am just loving the outside tablescapes! This is so soft and pretty, and I love the use of ALL the colors in the dishes. You and my sister have so much patience when it comes to waiting for sales! I have NONE! 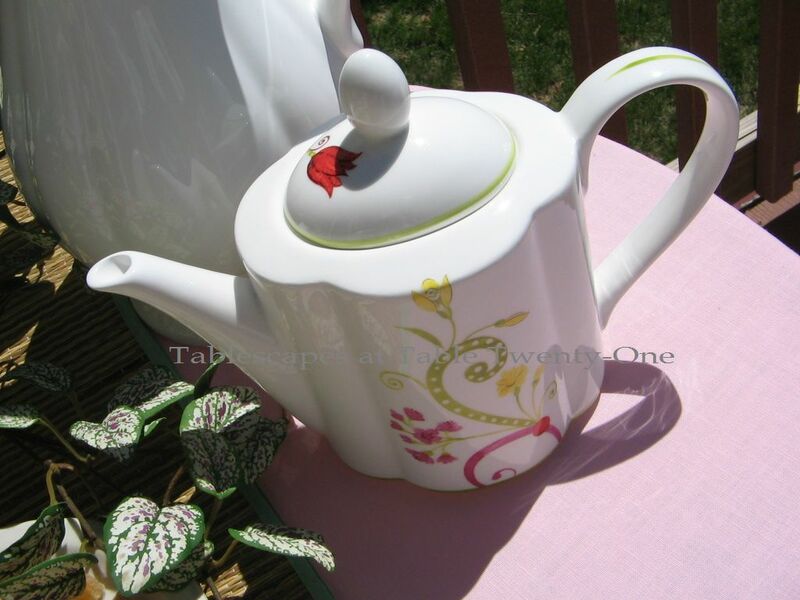 The shape of the teapot is so cute! Love the drama of the obelisks and carousel horse, and the combination of hydrangeas and roses is just lovely. Urns from K Mart? I never think about how I can paint something! Beautiful tables, Alycia! Ok this is a favorite, gorgeous. I think it’s the dishes I love them. All I have to say is- I’m adopting this as my birthday party table! I love those straw table runners applied to the table that way! The painted yellow urns look super and the obelisks open up many design ideas! Love the stemware- the green really pops and your flowers are perfect! They match the dishes so well! The carousel horse rocks- I love it! I can imagine using it for a variety of ideas! That bamboo runner is genius, where do you get your ideas!??! 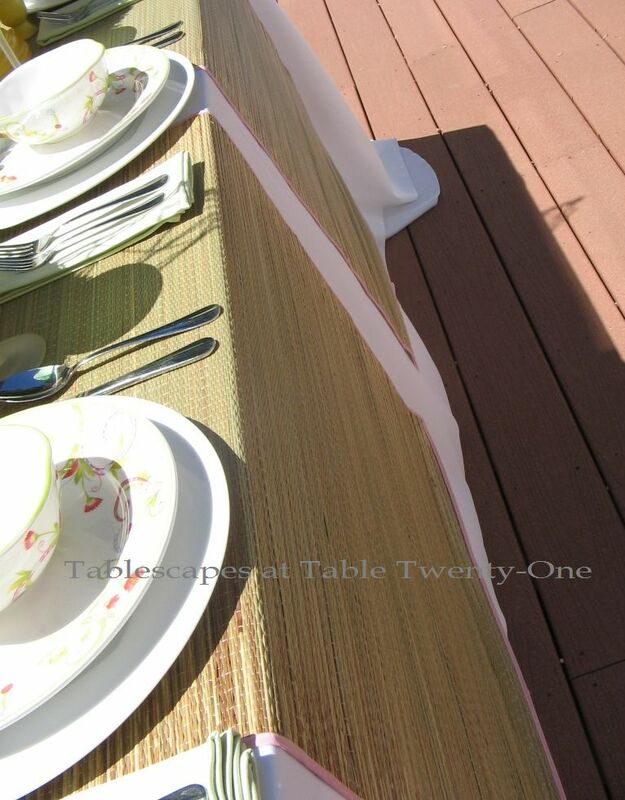 Your tables are so springy and light and so perfect for the season. I would love to take peek in your prop closets!!!! 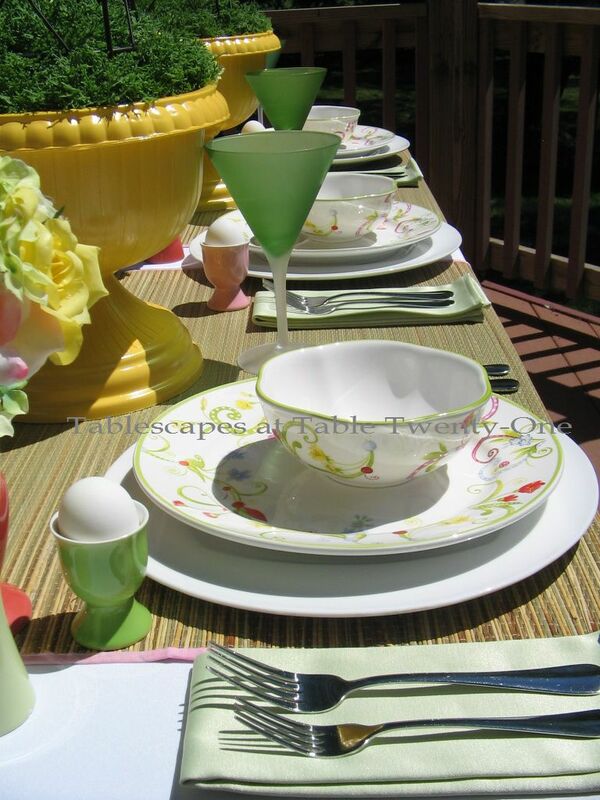 What lovely outdoor tablescapes, Alycia….soft pastels as the basis, followed by happy punches of colors in the plates & centerpieces. Great idea to use the dark wrought iron obelisks for height. They add lots of impact & style! Wish I owned some. I loved your comment “not as much fun as sipping your morning martini from an orange juice glass! 🙂 ” LOL I think the next time I serve mimosas, I’m going to use martini glasses & I’ll think of you while sipping! You did great! Love the bright yellow urns. The eggs are adorable. You have one lovely dish ware. Isn’t great to set a table outside? It’s raining here in sunny California. Gorgeous setting for your spring table. It is spring on the prairie, right? Everything is beautifully green down this way…I have even noticed lots of lilacs already in blossom…mine aren’t, though. Love your cheery yellow urns. I guess I’ll just live through you vicariously! Thanks for stopping and thanks for your words of encouragement! I love every single solitary table you do, but this one is a particular favorite for some reason. 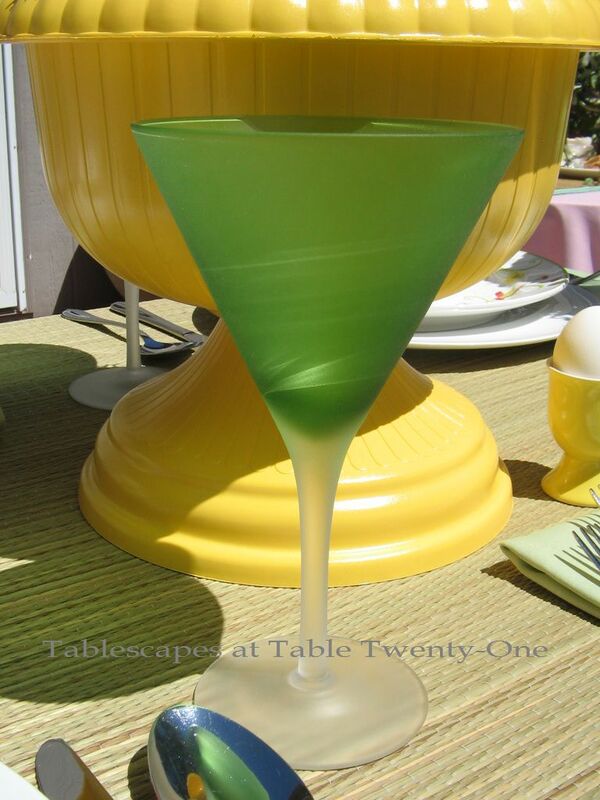 I love the colors, especially the way the green stemware looks next to the plate. You made me laugh out loud (literally) at the martini in an OJ glass reference. And btw, I couldn’t agree more that it just makes you feel special and fun to use different stemware for different purposes. A friend of mine served us grits from a martini glass at a brunch one time. I loved it. And they’re already done someone else’s rabbit hole. Loved it. You made me smile this morning. Oh I love this Alicia!!! It’s so dreamy and whimsical!! Spray painting clearance urns. Oh I love that idea! The colors are beautiful and the obelisks are just striking. I reworded my post. The egg wrappers are like shrink wrap. When you put it on the hard boiled egg and dip it in hot water it will shrink to fit the egg. The pickles are dill. My MIL would make them and her own mayo!! I want to sit on your deck and sip tea at this Alice In Wonderland party. Please invite the Mad Hatter! Those plates are gorgeous! Lucky you to be able to get so many on clearance at 75%. Usually our Pier 1 only has about 1 or 2 dishes when it get’s that low. I love the mix of colors on them and the design as well. Your setting is wonderful. I also like the way you used the rattan runners. Great ideas! Everything is so beautiful. What a lovely way to celebrate a birthday (or any occasion for that matter). I love your centerpiece. Really lovely and great planters! I am always delighted with how clean the tables. It’s nice to see the love with which they do. I love your table. It is really perfect for this beautiful time of year. My favorite is the carousel horse and the beautiful dishes. You are so talented. Thanks for sharing. Your table is so beautiful. It is perfect for this beautiful time of year. My favorite is the carousel horse and the dishes. You are so talented. Thanks for sharing. Usei o Google para traduzir meu comentário. Eu quis dizer: a forma como arruma a mesa. Alicia….I am loving this tablescape especially the centerpiece!! The bright yellow urns with the towering metal obelisk is just fabulous!! Thank you for lihnking up to Centerpiece Wednesday and sharing these ideas!! As always you inspire me! Again my friend you have out done yourself! 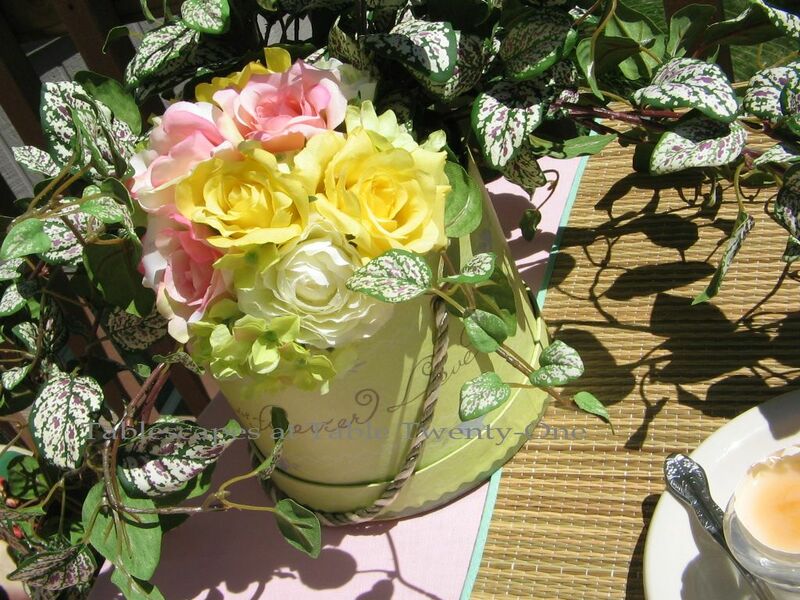 It is so beautiful….I love painting the urns. I would never have thought of that! I love your dishes and the teapot. I want to know when do you have the time to do all you do????? I think you are the best! Love you, Sister! 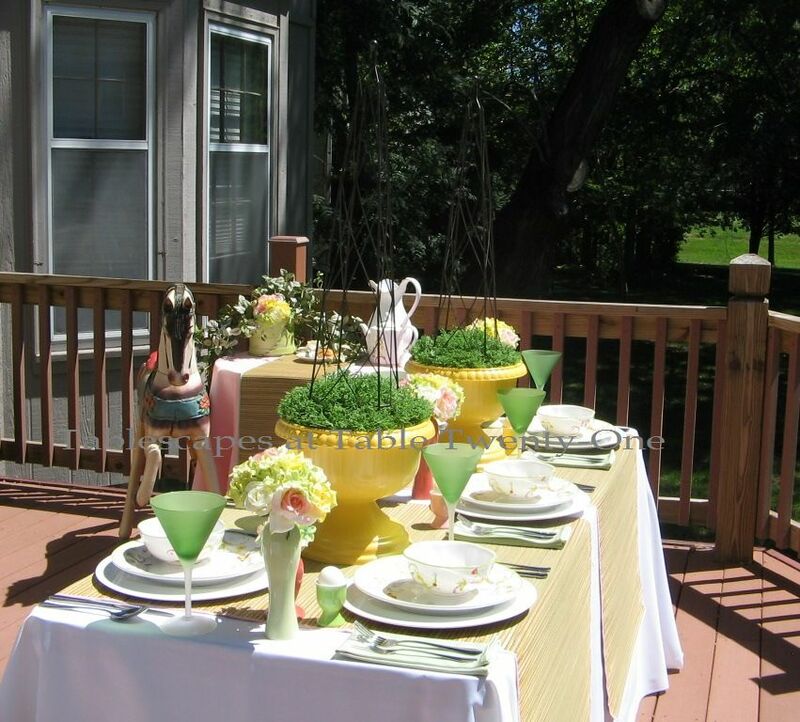 Love your outdoor Easter setting and the way the sun is shining on your space. 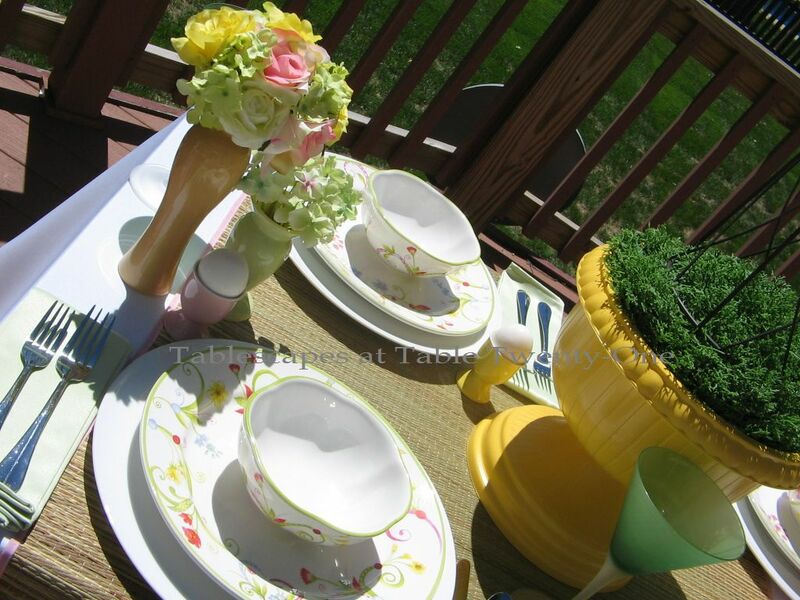 I really enjoy pinks and greens together and the yellow on those urns just gives the table a great pop! The urns on the table as centerpieces is a great idea. Those smokey green glasses are great! It’s a rare Easter here in the Seattle area that we’d be able to eat out on the deck. So pretty and inviting! What’s for brunch? I’m on my way! Love the urn centerpieces and the carousel horse! I would like to thank you so much for your sweet comment on my Spring Tablescape. I also hope you and your family have a wonderful weekend coming up. Such a cheerful table, Alycia! I like the whimsy of those plates, too. I just love your Lyda plates! They are so beautiful. Wow, to be eating outside already and it looks so wonderful and warm. I love how you used the mats to add texture and the two yellow urns on the table are great too. I can just imagine your storage spaces! Delightful table! Those goblets are such an unusual color of green and your dishes are so different. Great job, as always!! Alycia, this is so elegant and fresh! Gorgeous outdoor settings! So unique! Those beautiful colours of green are truly springtime delight. Yep, those yellow urns reeled me in, too!! How cool to add the obelisks, this table is so fun and fresh for spring!! I saw Liz’s post, and I just have to say that my birthday is in April and um, well maybe I could adopt your table for my birthday, too??? lol Except I’m pleading the fifth on the age thing… family tradition. But let me just say, we are all in the same neck o’ the woods!! Hope those nasty allergies are getting better!!! I feel so much happier after looking at this! Have a great weekend, all my little chick-a-dees are home this weekend, so I’m in heaven!! Take care! What a great idea to spray paint those urns. I love your beautiful horse as well. But my very favorite of course are your beautiful dishes!! GORGEOUS! 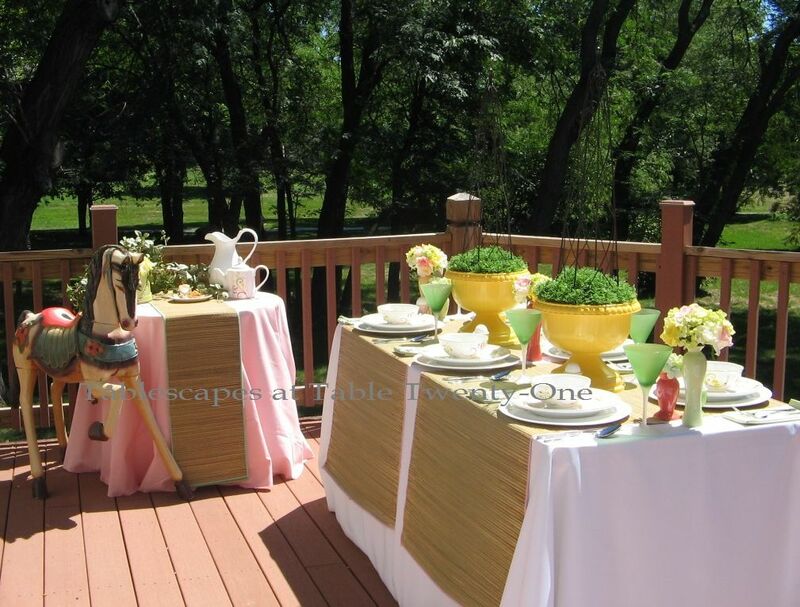 The deck looks like a wonderful sunny spot to have your table setting. It’s very pretty and love those green glasses. 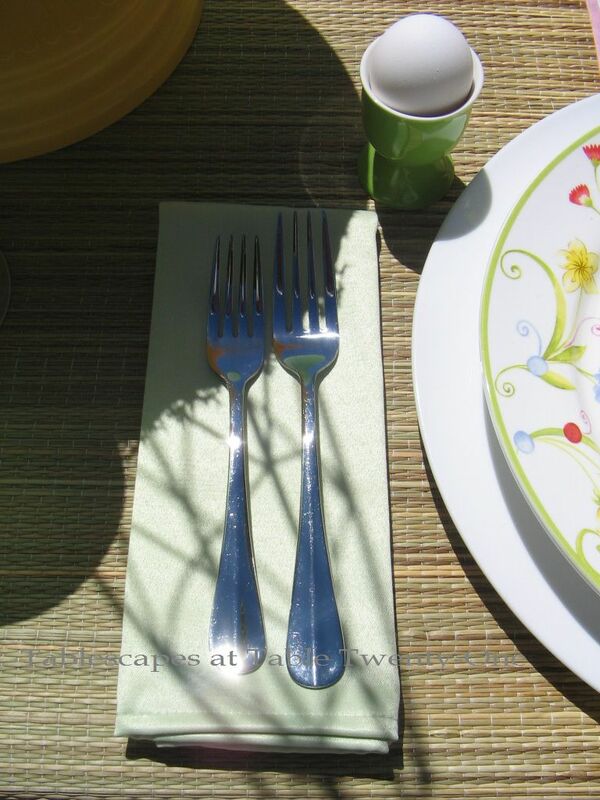 Looks like a wonderful sunny place for your table setting. Everything looks very pretty and I like those green glasses. How pretty those dishes are with their swirls! Love the spring colors — looks like the perfect garden setting. What a wonderful horse — it’s all quite magical. This is such a pretty tablescape. It makes me want to be there! I don’t know how I missed this! Love the idea of spraying the urns, they add such great color! Those glasses are wonderful. Everything looks so festive! It would be wonderful to celebrate Easter there! Great idea with the mats too!